Unlike the majority of computer vulnerabilities announced in the last few years, the latest Meltdown and Spectre threats exploit a flaw in the computer’s processor. There are very few processors that are NOT affected, in fact. Processes are the execution of the software that is going on constantly on your computer and the processor is the engine behind the execution of the processes. 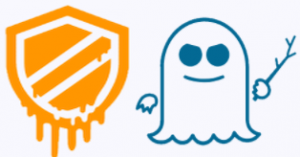 The Meltdown or Spectre vulnerabilities allow the secure memory information of a running process to be read which could expose sensitive information like passwords, banking information etc. The processor manufacturers (Intel, AMD, ARM – click to see their responses) along with software developers are working quickly to provide information and patches to address is the issues. There are a few things you need to do to protect your computer as much as possible and try to avoid some of the complications that can arise from the multi-vendor response to this situation. Update your anti-virus/malware software. Most of the major developers of these products have addresses the Microsoft patch issue by now. Many of my customers use Malwarebytes. Malwarebytes has released an update for it. If you use Malwarebytes you can right-click on the Malwarebytes icon in the System Tray in the bottom right-hand corner on your taskbar and click Update. If you simply want to see if you already have it you can open Malwarebytes, click on Settings and then the About tab. The Update Package Version should be 1.0.3624 or higher. After you have installed the latest update from your anti-malware/virus software, then check for the Windows Update. Type “Windows Update” in the search box on your taskbar or start menu and click on “Check for Updates”. Install any important updates that Microsoft recommends. The best way to minimize your computer’s exposure to these vulnerabilities is to install the important software updates and any chipset updates that become available for of your computer. If you need assistance with any of these suggestions you may contact The Computer Monkey for support. Previous post: CCleaner Compromise – What Do You Need To Do If You Use CCleaner?